Work on the vegetable patch has started in earnest with the warmer and lengthening days. Above, the poly tunnel is working hard to bring on an array of crops for planting out and also a few salad crops for eating now. It also doubles up as a "cat conservatory" as Charlie obligingly demonstrates . In the beds to the left are salad crops of lettuce, spring onions, radish, rocket and spinach. On the shelves are young tomatoes and aubergines and on the floor, courgettes, beans and peas that are nearly ready to go outside. There's a few cuttings of rosemary and mint and also some red Crocosmias corms we've potted on called Lucifer that should brighten up the summer borders. We've planted some edamame beans this year as a trial and instead of dwarf French beans we're growing climbing French beans this year. As an organic grower, you always have to think smart to beat pests, moving beans off the floor and growing them up in the air will definitely keep the slugs away from the produce when they mature. 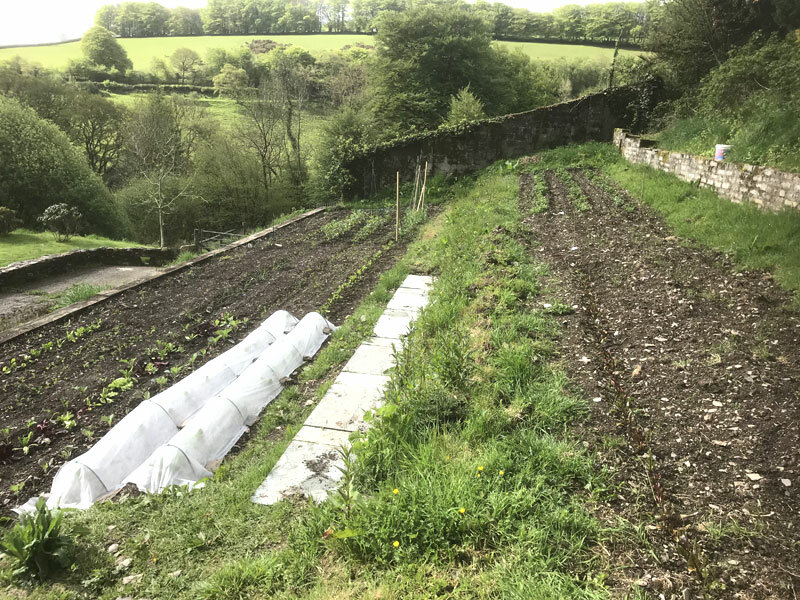 As well as cabbages the patch is nearly full with beans, peas ,carrots, onions, potatoes, beetroot, garlic, kale, broccoli, leeks, shallots, lettuce, and spinach. There's a few bare patches but they're reserved for the last remaining plants to come from the poly tunnel. Hopefully we'll be able to supply our summer guests with some tasty home grown veg when they arrive. 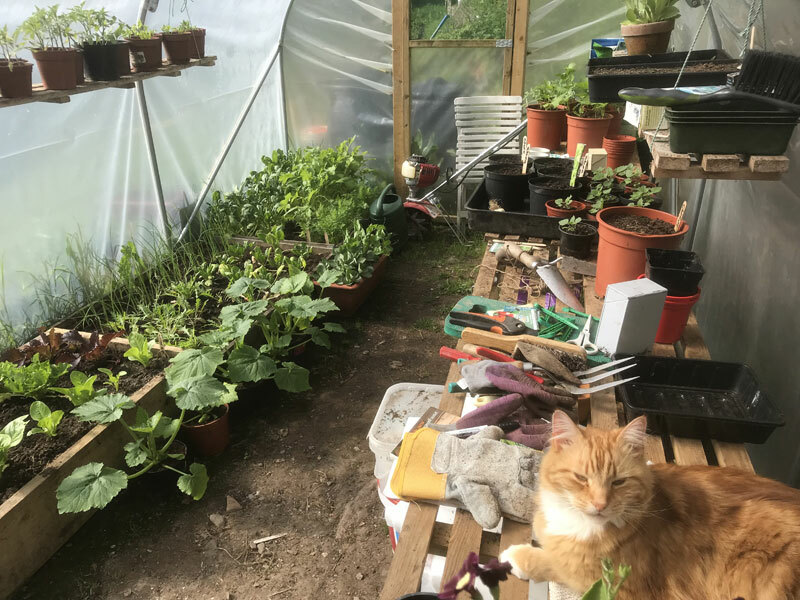 get Charlie out of the poly tunnel ! If you would like to stay with us and haven't booked already please note we are filling up fast.